With more than 500 million Facebook users across the world, it’s hard to refute that the social networking site has profoundly changed the way we communicate and share information. But what’s the Facebook effect on kids? When it comes to navigating the social networking world — whether it’s Facebook or fan fiction sites — the terrain becomes even murkier. Parents worry about what’s age-appropriate, what should be kept private, and exposure to cyberbullying, among many other issues. And it’s true — there’s a lot to navigate, even for adults. But Facebook and social networks aren’t going away anytime soon, and the better parents understand this, the more they’ll be able to help their kids comprehend the medium. Rather than block all access to the Internet, parents can see that for every pitfall, there’s a potential promise. For better or for worse, YouTube, Facebook, Twitter and their ilk provide ways for kids to connect with each other and express themselves. The irony is that the fear doesn’t come from the traditional so-called stranger danger but from how kids behave toward each other online. “Stranger danger is unbelievably minute compared to the social and emotional damage they receive from each other everyday,” Orsini said. And the matter becomes much more complicated when you consider that strict anti-bullying laws render schools responsible for kids’ online behavior, he said. But for administrators like Eric Sheninger, principal of New Milford High School in Bergen County, N.J., privacy and cyberbullying issues are a red herring. “What if a kid swears in the hallway? It’s the same thing. People want to hide behind the legal issues, but it’s the same as swearing on Facebook,” he said. Either way, kids will have to learn that their digital footprint is born from the moment they start posting on each other’s walls and create their first online avatar. They’ll have to figure out that every YouTube video they upload will be a reflection of themselves as the public sees them. With guidance from parents and educators, they can figure out what the world knows about them. It’s important to note that Orisini is the principal of a middle school, while Sheninger is the principal of a high school, and the age difference can be a factor in how kids behave online. Chances are, anytime the computer is on near a kid (and let’s face it, even adults), some kind of social networking is happening. Whether it’s Facebook or instant messaging, or watching or uploading videos to share, the distractions are endless. As we all know, one link can easily lead to another, until suddenly an hour and a half has passed and we’ve lost track of the task at hand. Last year’s comprehensive study by Kaiser Family Foundation found that kids age 8 to 18 actually manage to pack in almost 11 hours worth of media content into 7½ hours of using media. So is there any time left for learning? Researchers like Henry Jenkins would argue that the best kind of learning — engaged and collaborative — is happening on social network sites. Jenkins, who is a professor at the University of Southern California, talks about “deeply meaningful forms of learning…taking place through engagement with affinity groups and social networks online” such as the Harry Potter Alliance, which has mobilized more than 100,000 people against the Darfur genocide and labor rights at Wal-Mart. But because of privacy laws like the Children’s Online Privacy Protection Act, most schools shut off access to social networking sites — with a few exceptions. To principal Sheninger, “if you’re not on Facebook, you can’t really communicate with us. Our new hub of real-time information is Facebook. I post things about what the kids are doing, and when they comment or parents comment, as a principal, I’m proud,” he said. Facebook’s changing privacy settings and its tendency to default to more open information is a source of constant annoyance for many of its users. We have to keep close tabs on those changes, especially when it comes to kids. But young children are not the primary target user for Facebook, which officially does not allow kids under 13 to sign up for an account. 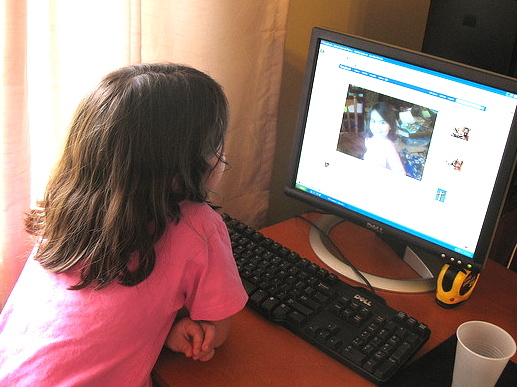 Parents must decide whether they’ll allow their children to become a part of the vast Facebook network, or to harness the social networking world into smaller, more contained sites like Togetherville or Club Penguin. Parents can use the subject of privacy settings as an opportunity to teach kids about navigating the online world. They can talk about social media etiquette and what information they agree is acceptable to be shared with friends and the public at large. With guidance and support, and with parents setting examples of what they think is appropriate, kids can learn their place and responsibility as part of a worldwide community. 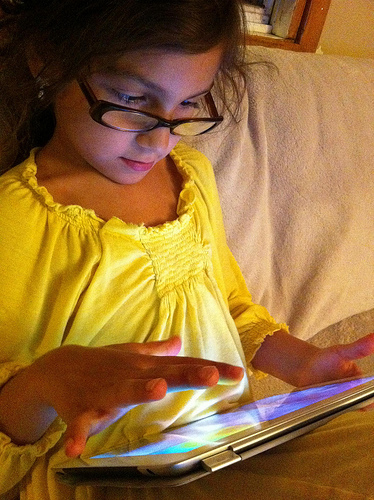 Photo of girl with an iPad by Alec Couros via Flickr.